- Its location allows you to relax with the nature around you and watch the spectacular view. 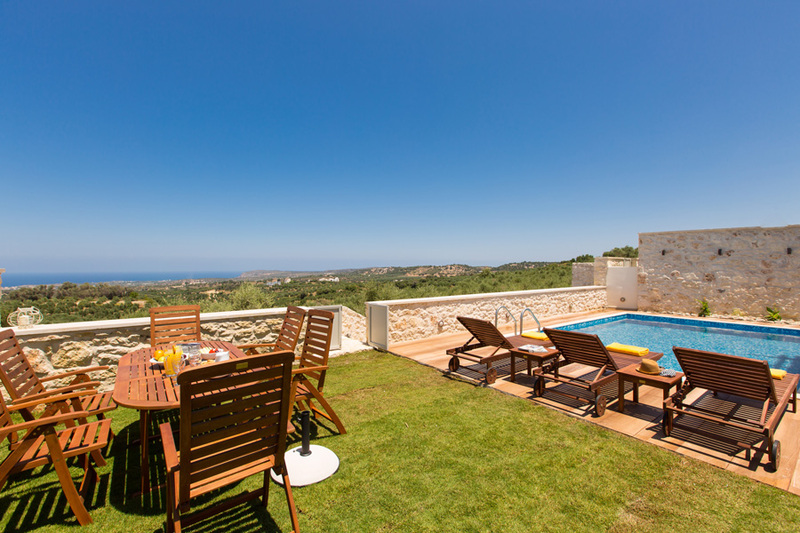 - It offers full privacy to the guests and has a perfect Garden and pool area! 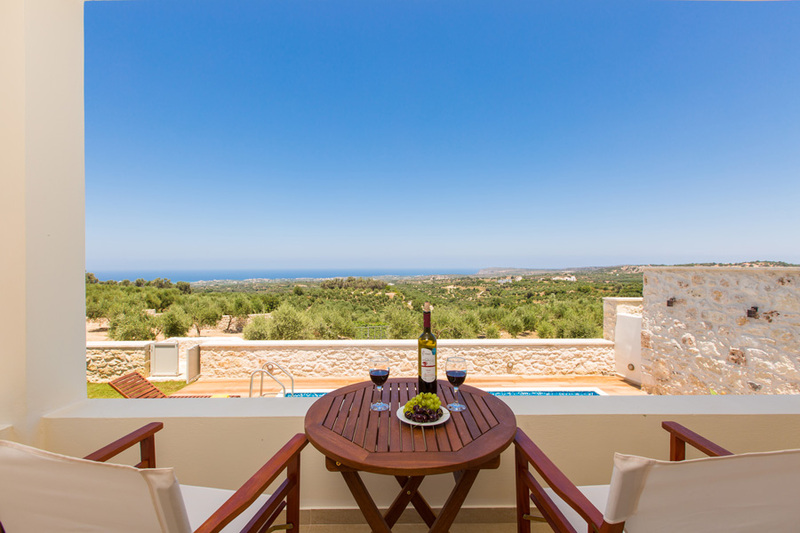 - The Villas are fully equipped to fulfill any of your needs! 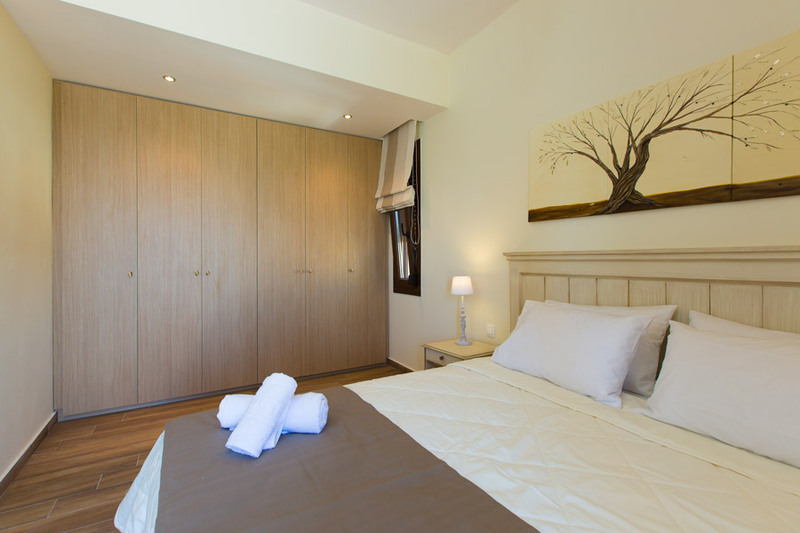 Roupes Villas is approved by Greek Tourism Organization with license number: 1041K91003115801. The kitchen boasts all the facilities you require to meet your self- catering holiday needs. Patio doors take you through to a veranda which looks out onto the garden and pool area. All beds are of superior quality and linen and towels are provided. Patio doors in each bedroom lead you out on to a balcony where you can enjoy a breathtaking sea view and panoramic views of the northern coast. The lounge area features comfy sofas, flat screen TV with satellite channels, DVD and CD player. WIFI internet is available throughout the villa. 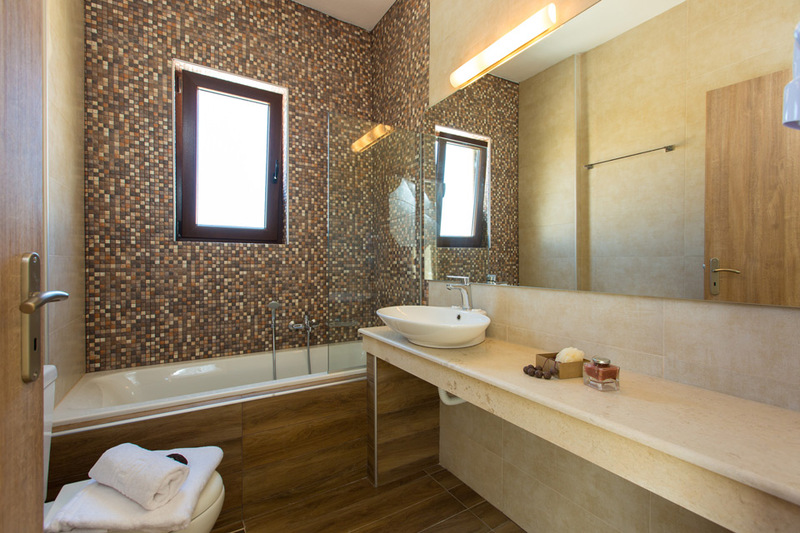 There is also a beautifully fitted bathroom on the upper level with a walk in shower. The garden boasts a 30 m² private swimming pool and spacious grounds with a grassed area for children to play. 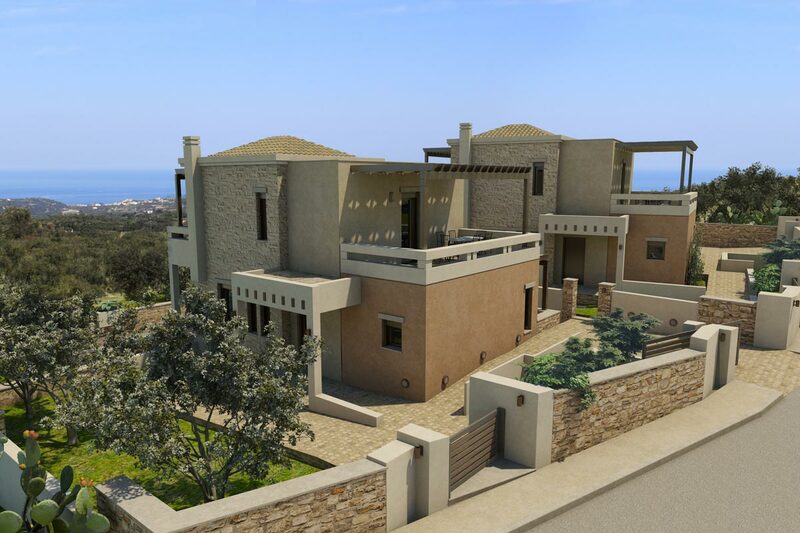 Each of our contemporary villas is built on two levels and has 3 bedrooms and 2 bathrooms. On entering the villa on the ground floor there is a spacious lounge, dining area and a fully-equipped open plan kitchen. The lounge area features comfy sofas, flat screen TV with satellite channels, DVD and CD player. WIFI internet is available throughout the villa. 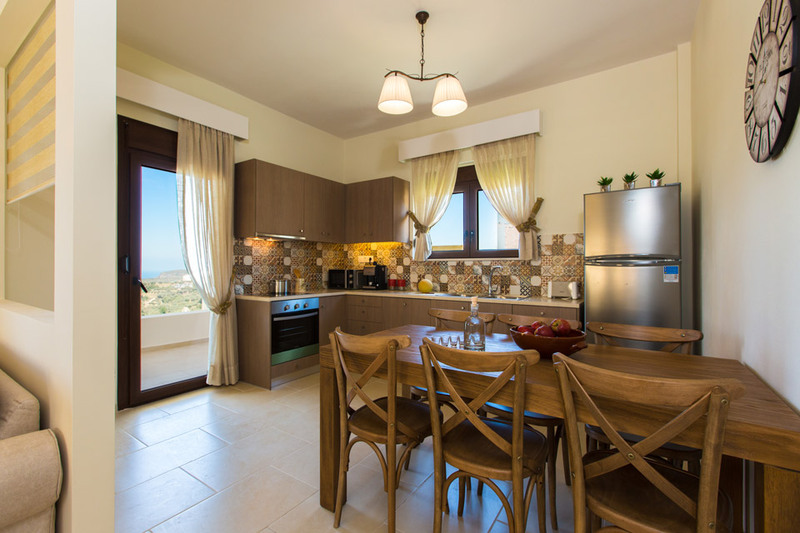 The kitchen boasts all the facilities you require to meet your self- catering holiday needs. Patio doors take you through to a veranda which looks out onto the garden and pool area. On this level we have a pretty double bedroom with twin beds, wardrobe and flat screen TV and there is a beautifully tiled full-fitted bathroom with a walk in shower for your convenience. We provide a good quality sofa bed that can accommodate an extra person. All areas are tastefully decorated featuring modern furnishings with traditional touches. Baby cots and high chairs are available on request. A marble staircase leads you to the upper level of the villa. On this floor there are two largedouble bedrooms, one with a double bed and the other with twin beds, both with stylish furnishings, wardrobes and flat screen TV’s. 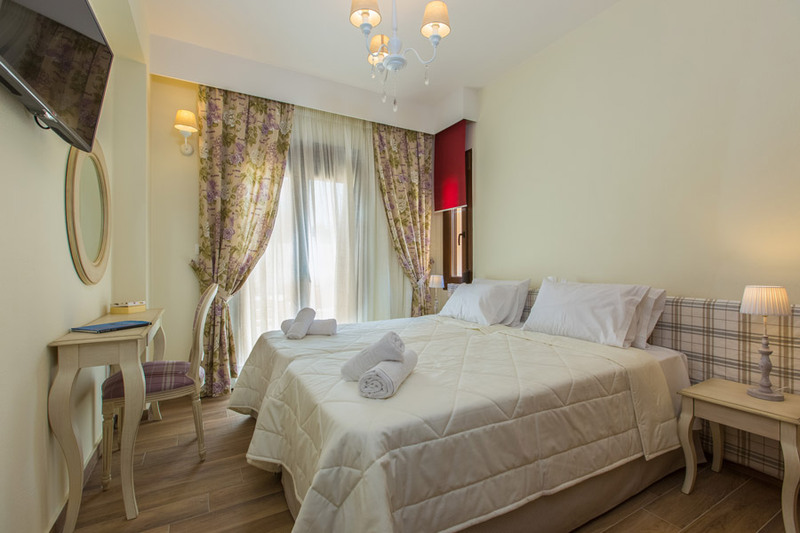 All beds are of superior quality and linen and towels are provided. 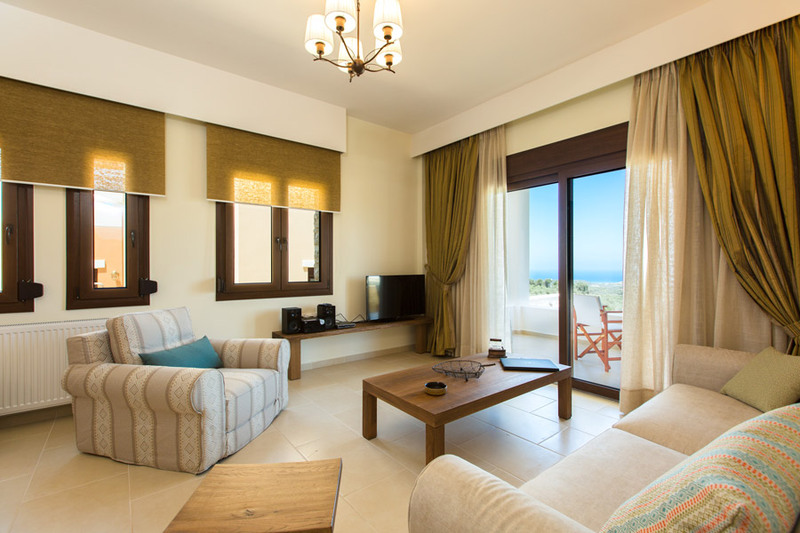 Patio doors in each bedroom lead you out on to a balcony where you can enjoy a breathtaking sea view and panoramic views of the northern coast. 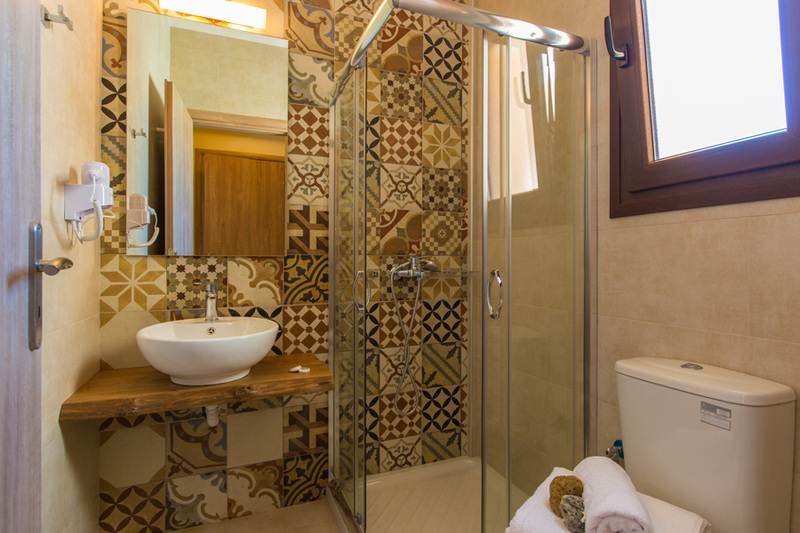 There is a fully equipped luxurious bathroom with a large bath tub. The showstopper on the first floor is the very large furnished terrace to the rear of the building (25 m²) which offers spectacular views of the mountain range and the natural environment of olive groves and orchards in the surrounding area. 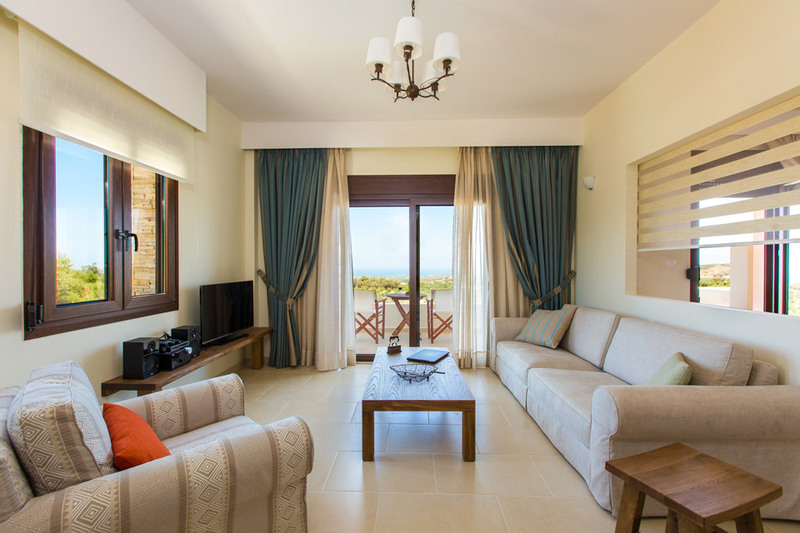 Each villa is fitted with personalized central air conditioning and heating systems which ensure all rooms in the villa have the perfect temperature to enhance your stay. The garden boasts a 30 m² private swimming pool and spacious grounds with a grassed area for children to play. 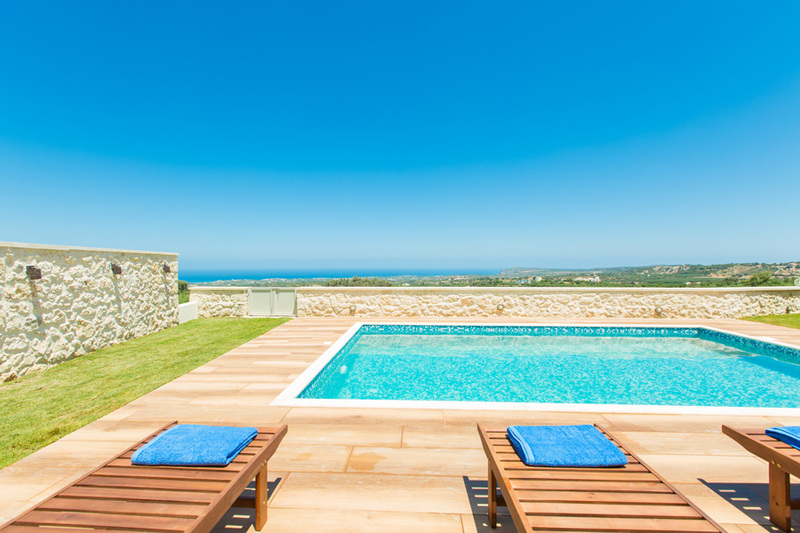 The grounds are secured by an attractive traditionally stone built wall which complements the exterior design of the villa, whilst ensuring privacy. 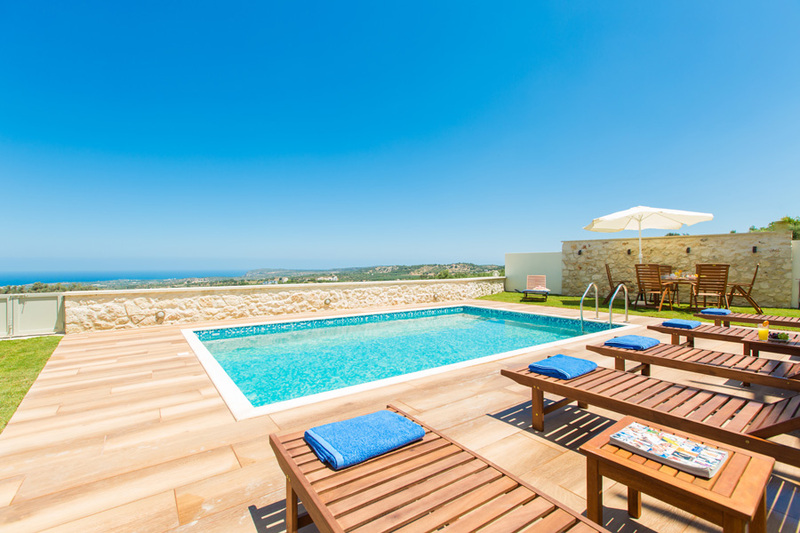 Around the private swimming pool there are sun loungers and sun umbrellas for your comfort. You will be able to relax and enjoy the sunshine uninterrupted within the comfort of your own garden. 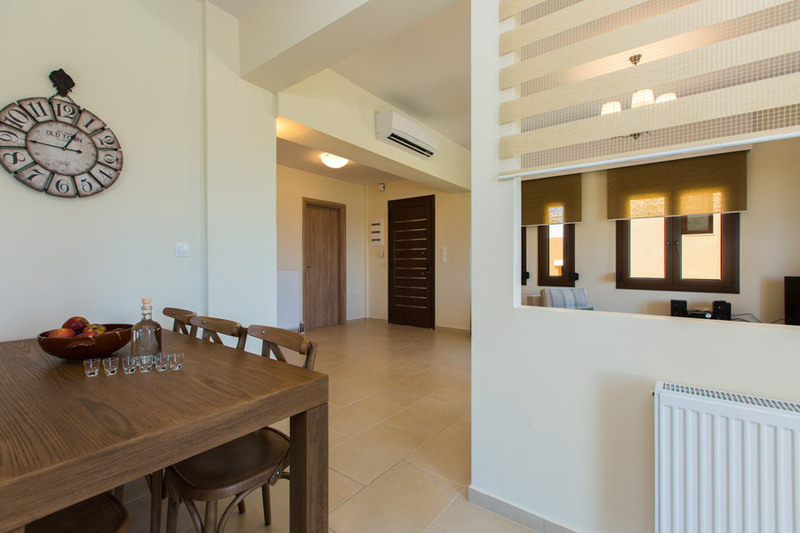 Each villa has its own private parking area and all units have been specifically designed to accommodate guests with limited mobility. 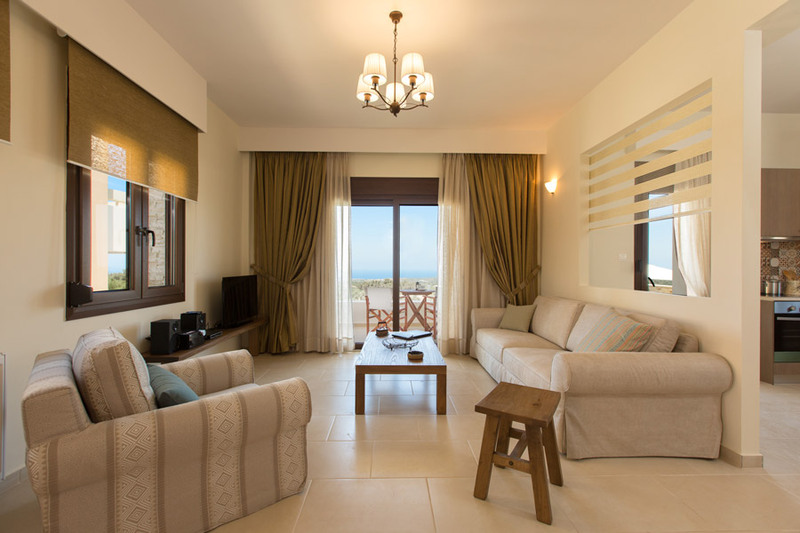 BBQ facilities are available and each villa comes complete with outdoor furniture, perfect for al-fresco dining. The surrounding area itself has a lot to offer. You can tour the nearby local villages and get a taste of how the Greeks live and experience Greek hospitality. There are hiking and cycling routes in the vicinity, offering you the chance to dicover the Cretan countryside and enjoy the breathtaking views of the imposing mountain range of Psiloritis which stretches from the North West of the island down to the South East. This area is paradise for anyone who loves to explore nature. Ideally situated in the centre of the island, it is easy to reach many of the beautiful beaches Crete has to offer. Only 7km from your villa is Rethymno beach. The area is also steeped in history and archaeology. Roupes is only a few kilometers from one of the ten greatest discoveries of the world in the year 2010 by the Archaeology Magazine, Ancient Eleftherna. Taverna Smaragdi is located in the neighbouring village of Skouloufia, so you needn't travel far to enjoy a traditional Greek meal. Taverna Smaragdi serves only fresh local produce and you can try some of the Cretan specialities. Highly recommended. Upon exiting Heraklion airport, travel west along the coastal highway for about 70km, (50 mins) until you reach the exit to Sfakaki (Rethymno). Turn right and go under the bridge. You will continue heading back east on the old main road for 4.5km (9mins) until you reach the village of Viran Episkopi. Take a right onto the road signposted for Arkadi / Eleutherna / Roupes and continue for 2.4 km. Take a right when you see the sign for Pikris / Roupes and continue for 1km. Roupes villas are on your left. Press here to get directions from Heraklion Airport to Roupes Villas. Press here to get directions from Chania Airport to Roupes Villas. Press here to get directions from Rethymno city to Roupes Villas. The Monastery of Arkadi is a historic monastery in Crete. According to tradition founded by Emperor Heraklion and rebuilt around the 5th century by the Byzantine Emperor Arcadius, whose name bears his honor. Press here to get directions from Arkadi Monastery to Roupes Villas. Ancient Eleutherna is located at a distance of only 5km from Roupes village. This was once an ancient settlement dating back to 850BC. Ruins of Hellenistic walls and buildings, Roman structures and an Early Christian basilica have been preserved and you can visit the cemetery of the Late Geometric and Archaic periods, part of which was covered by the Roman buildings. Press here to get directions from Ancient Eleftherna to Roupes Villas. 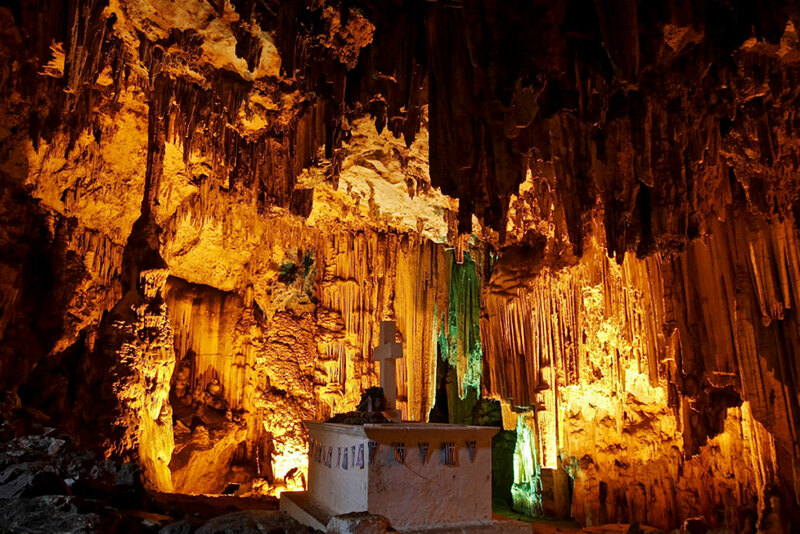 The Melidoni cave is on the "Old Heraklion Road" between Rethymno and Heraklion. It is one of the three large caves on Crete which is open for tourists. The Melidoni cave has been inhabited almost continuously since the Stone age.The cave can be reached by 61 steps. The cave itself consists of three separate rooms, of which one is accessible for tourists. The chamber consists of one big room with stalagmites and stalactites. Press here to get directions from Melidoni Cave to Roupes Villas. Anogeia has become a popular stop for tourists. A very traditional Cretan village, it is very interesting to see how the inhabitants lead a very simple way of life. 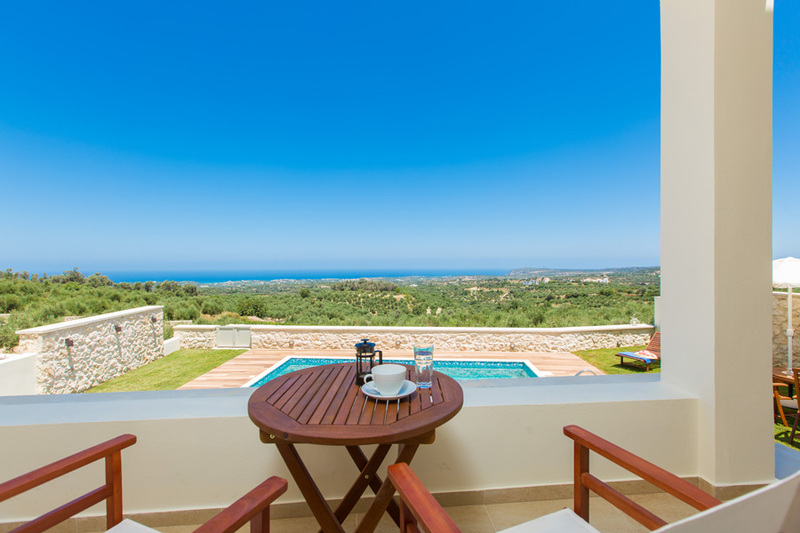 This picturesque village offers amazing panoramic views of Crete's northern coastline. There are various handicraft and cloth workshops and many of them are open to the public and it is possible to see cloth being woven on large looms. There are many taverns, cafes, and restaurants as well as small local museums. Press here to get directions from Anogeia Village to Roupes Villas. There are beautiful sandy beaches west as well as immediately east of Stavromenos, in the two neighbouring villages of locator Sfakaki and locator Scaleta. Press here to get directions from Stavromeno to Roupes Villas. You can find a mini market at Stavromenos Village. 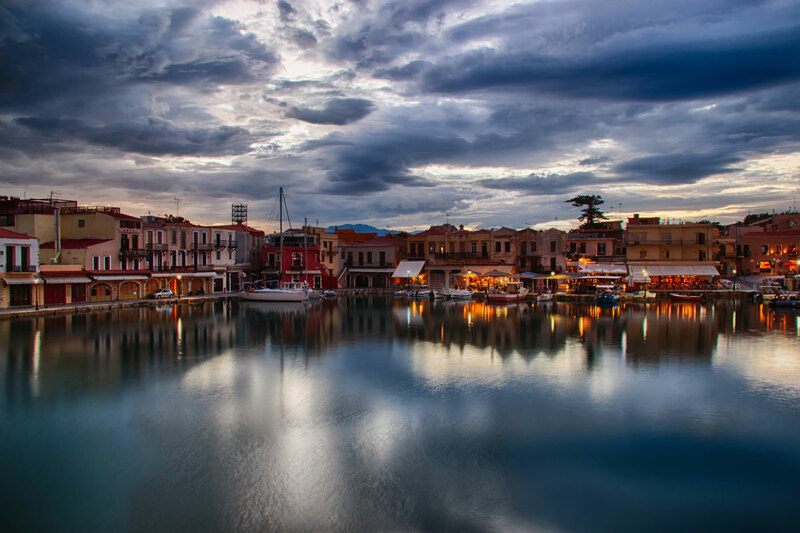 The village of Roupes is situated in a peaceful location south west of Rethymno town. The surrounding area itself has a lot to offer. You can tour the nearby local villages and get a taste of how the Greeks live and experience Greek hospitality. There are hiking and cycling routes in the vicinity, offering you the chance to discover the Cretan countryside and enjoy the breathtaking views of the imposing mountain range of Psiloritis which stretches from the North West of the island down to the South East. This area is paradise for anyone who loves to explore nature. There are numerous caves nearby. There are the impressive Melidoni and Zoniana caves and the Ideon Andro cave, which was seemingly the birthplace of the Greek God Zeus in accordance to Greek Mythology. 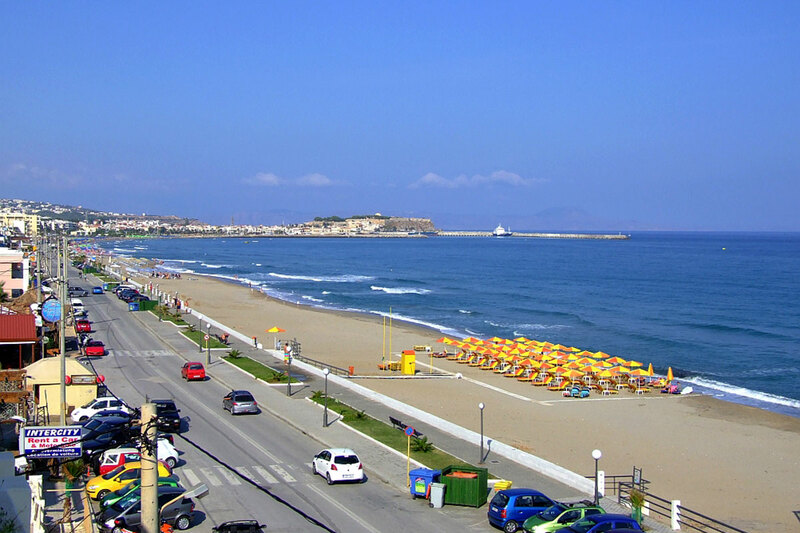 Rethymno town is easy to reach, being only 18km from Roupes. It is about a 15 minute drive along the highway to reach the town centre. Here you will find the local hospital, post office, large super markets and lots of shops. The flea market, held on Thursday mornings is usually attractive to tourists. This charming town maintains its aristocratic appearance, with its buildings dating from the 16th century, arched doorways, stone staircases, Byzantine and Hellenic-Roman remains and small picturesque Venetian harbor. There are numerous museums and an imposing fortress looking over the old town.A Renaissance festival takes place in the fortress grounds every year providing entertainment throughout the summer months. However the old town is where you will find an array of nightlife, from lively little bars and restaurants in the narrow streets to relaxing waterfront cafes. Only 5 km from your villa, the amazing ruins of the Ancient city of Eleftherna are a must to visit. This archaeological site is still under excavation and new discoveries are being made. Named one of the ten discoveries in the world you will find important artifacts dating back to the dark ages, geometrical era through to the Byzantine period. The excavations of this ancient city, once known as Apollonia, have revealed settlement patterns, sanctuaries and a necropolis. This once powerful and independent city was home to numerous famous poets, philosophers and sculptors. At a distance of only 6km from your villa you will discover the Monastery of Arkadi. 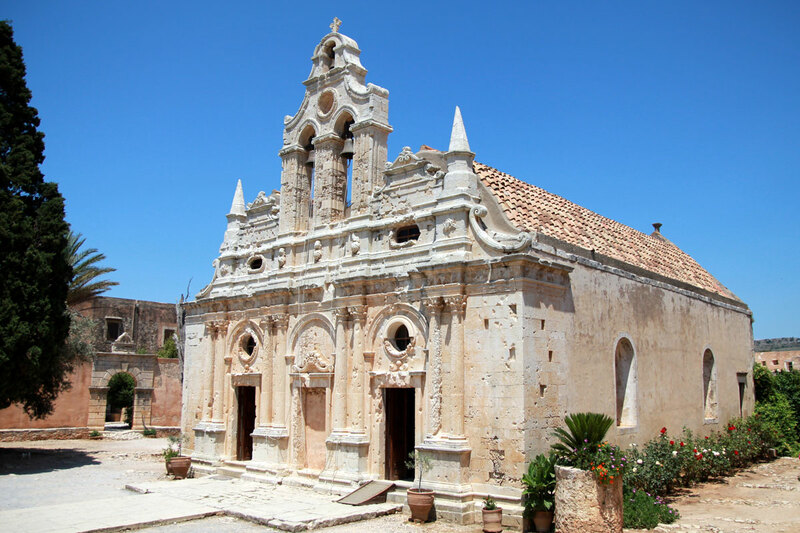 This famous monastery is of particular importance to not only the people in the district of Arkadi, but to all the inhabitants of Crete.The monastery building is a specimen of Cretan Renaissance architecture but it is better known for the heroic events and tragedies that have taken place within its walls, dating back to the 16th century. The most famous historical event was the holocaust of 1866 which led to the withdrawal of the Turks from the island who had held it since 1669. Crete then won its independence and was reunited with Greece. Just a bit further away, 16 km from Roupes you can visit Melidoni cave. Also known as Gerontospilios, this cave is very important due to its archaeological findings that are exhibited in the Archaeological museum of Rethymno. The artifacts date back to the Neolithic period, some 4000 years ago and as legend has it, this was once home to the giant Talos, who was given by Zeus to King Minos to protect Crete. 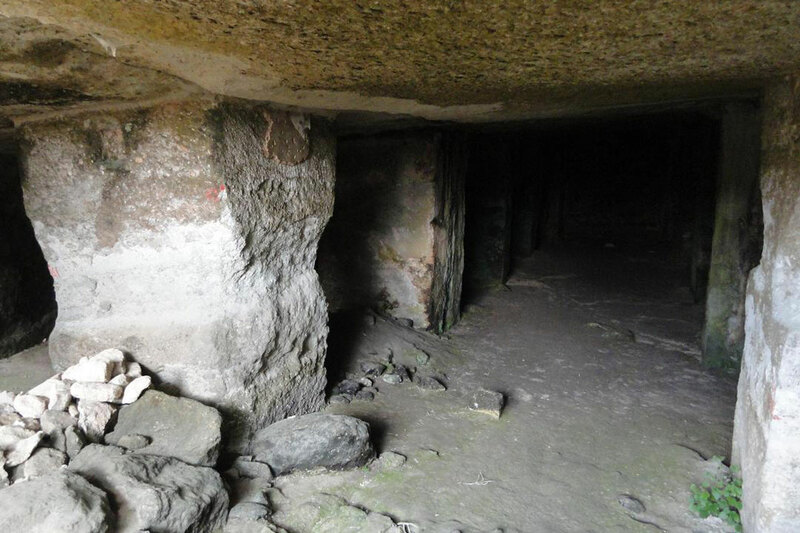 This cave, similar to Moni Arkadi, also played a tragic role in the history of the Cretan revolution against the Turks. Many women and children were suffocated here as a result of a fire which was lit at the entrance to the cave by the Turks. Today there is a large sarcophagus within the cave containing the bones of those who were killed. The beach of Rethymno, with its golden sand and clear blue shallow water, is located 1km to the east of the town of Rethymno. This organized beach continues for a length of 12km and stretches right up to the bay of Skaleta.Within the town and the surrounding area the beach can be very crowded but heading west you will find parts with very few people. The nearest area you can access the beach is at Stavromenos at approximately 7km from the complex. At this part of the beach you can find beach bars, beach loungers and umbrellas. There are also more private areas in the vicinity.